I just won the vintage Scarpa rock climbing shoes on Ebay!! I am soooo excited because they are really vintage, and I love the colors. They are hardly used, too! I really like going rock climbing. Its fun, and good exercise. The shoes help you climb because they have a lot of rubber on them, which helps you grip the wall, even when there are no grips on the wall. They are also form-fitting to your foot, unlike gym shoes, which have bulky sides. We go climbing at XSport Gym, and at the Y. 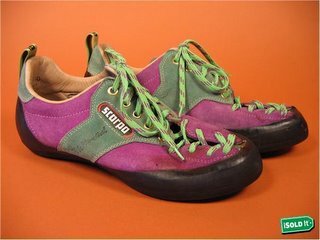 Next week, once they come in the mail, we are going to Vertical Endeavors, a huge indoor rock climbing facility. I am training with weights at the gym too, so that I can do a pull-up all by myself. It'll help me climb much better. I am also improving my grip, which is suprisingly very very helpful, more than arm strenght! If you can't grip something, no matter how strong your arms are, you aren't gonna hang on!!!! Next, I'm searching for climbing harnesses on Ebay. Women's sizes are not so popular, because its mostly a guy sport. There are so many men's shoes, etc on Ebay, but only a few women's things, and I'm so lucky because there are also few bidders for womens' items! Informative article sharing this post. I really appreciate this post.